Intermittent warm water circulation does prevent frozen water pipes more thoroughly and uses a fraction of the energy required by heat tape. 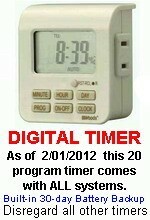 "I have had my readytemp for two years. It's been below zero the last few days and a wind chill over -30 Fahrenheit last night. My water is flowing through my pipes nicely. The real test was this last week and it passed with flying colors. It's nice to have that piece of mind waking up in the morning. Especially, after years of trying to unthaw my pipes. This morning I sat in my toasty warm mobile home while my neighbors were busy under their crawlspaces thawing their pipes. " HOW IS READYTEMP BETTER AT PREVENTING FROZEN WATER PIPES? In short, because the water in the pipes is kept at a temperature of your choosing through temperature-based "as needed" cyclic-pumping. Based on the temperature-setpoint you choose, ReadyTemp will intermittently circulate warm to ambient temperature water throughout both hot and cold water lines. Since the thermal energy is contained in the water 100% of that energy is utilized in preventing water from freezing inside your pipes. The act of circulating water makes it even more impossible for water crystals to form. Conduction (or heat conduction) is the transfer of thermal energy between neighboring molecules in a substance due to differences in temperature. Thermal energy always transfers from a region of higher temperature to a region of lower temperature. As illustrated above, when the divider separating the hot water (red) and cold water (blue) is removed the two bodies of water interact transferring heat until all atoms are of a common temperature. Cold water contained in a pipe connected to a pipe containing warmer water will result in the same interaction regardless of complexity or pipe layout. The transfer of thermal energy throughout the homes pipes continues until all water is the same temperature. These circles depict hot water molecules interacting with colder molecules. This movement continues through all pipes connected to the main until a common temperature exist. Residual heat slowly moves throughout pipes until a common temperature is reached including the water contained in pipes which branch off from the main line. The below image shows how little (<50%) of the cable actually contacts the pipe. Significant energy is repeatedly lost to outside elements, pipes / fittings before effecting the water contained within the pipes. At 7 watts per foot it's far from being a green friendly solution. Pipes may freeze even if they are not exposed to outside air. In extremely cold weather, even pipes that run along exterior walls or through crawl spaces can freeze. Residents of mobile or modular homes and recreational vehicles are particularly susceptible to this problem. Until recently, homeowners were left to using heat tape or heater cables to prevent frozen pipes. Aside from the sophisticated installation required of these products, high energy consumption (7 watts / foot), maintenance requirements and safety concerns make this option less than ideal for many homeowners. 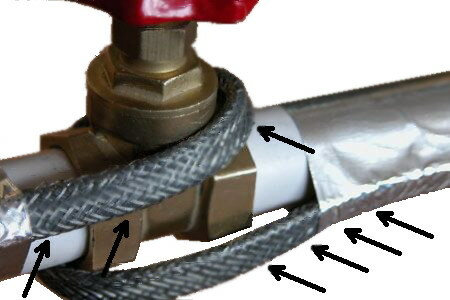 Often plumbing is inaccessible to wrap pipes with heat tape. The multitude of advantages to the homeowner from using a ReadyTemp compared to using heat tape makes choosing the ReadyTemp a no-brainer. Often pipes outside the home freeze and prevent water flow . 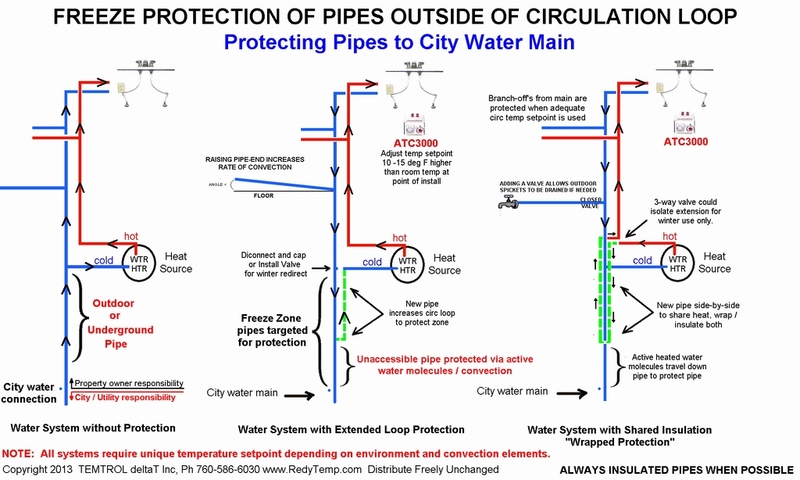 The above illustrates how a number of ReadyTemp owners solved frozen pipe problems in pipes located between the water heater and the city water main / water meter. These solutions require a higher than ambient temperature setpoint in order to protect underground / inaccessible pipes. Measuring the effectiveness of protection / chosen temperature setpoint, requires opening the closest cold water tap and feeling how cool the first few seconds of water coming out the tap feels. Increasing ReadyTemp's temperature dial extends the reach of protected pipe. An efficient setpoint temperature is achieved when the water in the pipes is maintained between an ambient and cool water temperatures. If the water coming out the cold tap is warm or hot, then the temperature setting is too high. Water lines which provide drinking water to livestock, animals, pets, etc can also freeze. Adding a second line provides heat source needed to prevent original cold water line from freezing. Insulating both pipes is essential to minimize energy demand and pump cycle operations. In situations where animal watering systems are to be protected from freezing, steps should be taken to prevent animals, pets or kids from touching, stepping on, kicking or chewing on device or hoses or power cord. System should be placed in an enclosed, water resistant wooden or metal box to prevent water, dirt or other particulate from damaging the unit when installed in an outside environment. "I just wanted to let you know that our little Readytemp unit passed all tests with flying colours! We had -30 C temperatures (not including wind chill) and we had absolutely no problems with the pipes!! Thank You for all your help, and I look forward to many "no frozen pipes" winters to come!" "Just wanted to let you know that the first day I installed my readytemp 3000 [which took all of 20 minutes] the temperature went down to -40 c. I had no problems with freezing pipes in my home crawl space. The instant hot water is also a great bonus. You are selling a great product." ReadyTemp "intermittently" circulates water throughout a homes water pipes to prevent pipes from freezing. When heat tape is used to protect pipes much of the heat and energy is wasted because, only a small amount of the tapes surface actually touches the pipe it's intended to protect. However, when heated water is intermittently circulated throughout a homes pipes a significantly higher percentage of thermal energy is absorbed by water in connected pipes as well as the "inside surfaces" of the pipes themselves for additional protection. By keeping the water within the pipes at above freezing temperatures combined with the movement of the water during circulation, water crystallization is impossible. ReadyTemp is engineered with adjustable temperature control from 45F - 115F. To prevent pipes from freezing homeowners need only set the temperature dial to an appropriate temperature depending on the freeze threat condition. Extreme conditions (well below zero) would require a higher temperature setting than a temperature of just 20F. ReadyTemp®'s unique temperature range offer's homeowners the added benefit of saving thousands of gallons in potable water each year by eliminating long waits for hot water throughout their home. The multitude of benefits to the homeowner and the resource savings make the ReadyTemp a win, win situation. To prevent frozen water pipes, pipes often require more than just insulation, they require heat. Using electrical energy (heat tape) to heat water "inside" pipes wastes energy. Using heated water is more efficient and economical. The energy consumed to protect just 10 feet of pipe with heat tape is 3 times the energy a ReadyTemp would use to protect a whole homes plumbing system. To prevent frozen pipes some suggest keeping the heat on in the home and opening cabinets and doors. Not only is this inconvenient, it's easy to forget and not guaranteed to work. ReadyTemp prevents frozen pipes from inside the pipe. Without the ReadyTemp, preventing pipes from freezing in area's that are hard to see or reach can be challenging and expensive. Since ReadyTemp prevents pipes from freezing from inside the pipe there's no tearing down walls or entering crawlspaces to install heat tape. Preventing frozen water pipes by installing heat tape can take hours just to prepare the pipe, measuring and calculating how much tape, etc. Worse case, walls need to be opened up to access pipes which need to be wrapped. ReadyTemp®'s 3-step install is simple and easy, enough that 95% end users choose to install it themselves. Especially, since the whole process can be accomplished in less time than it takes to have a pizza delivered. Repeatedly, having to change a blown fuse on heat tape in the freezing winter time can be very frustrating and worry some when a home is left unattended. ReadyTemp utilizes a homes water heater to protect pipes from freezing. As a result, no blown fuses, just trouble-free dependable protection, year after year. While heat tape should be inspected yearly, ReadyTemp is maintenance free and requires no inspections. ReadyTemp owners benefit all year long from water savings, NO-WAIT hot water convenience and an overall more efficient lifestyle. Compared to heat tape which benefits the homeowner only during cold seasons. Some homeowners qualify for rebates from their water companies due to the large amount of water savings that occur when using one. Calculations have shown that a family of 4 which waits an average of 1 minute for hot water to arrive at their taps / showers, spends an accumulative total time each year of 97 hours of combined waiting time. Saving water in large quantities has a positive affect on septic systems and waste water treatment plants. Resulting in lower cost to operate / maintain and extending their lifespan. "I just wanted to report that with temps at -12, my uninsulated pipes DID NOT FREEZE!! I was ecstatic to have running water in the AM. Thank you so much and I have been spreading the word about ReadyTemp!" "I was very pleased that the pipes didn't freeze when we hit a freezing spell (TEMP below -14 F). Additionally, I'm pleased to have instant hot water." "I live in a RV year round and Kansas gets below 0 sometimes and this unit so far has kept me from frozen pipes. AWESOME UNIT Thanks." NOTE: owners of "tankless" water heaters should use TL series models.